Jack Twiggle has a dilemma. He needs a fantastical tale to impress his friends and teacher. But how do you come up with something exciting when you’re just staring at your plain old backyard? Join Jack and discover that things aren’t always what they seem when you add a little imagination, and knowledge of some incredible groups of animals! 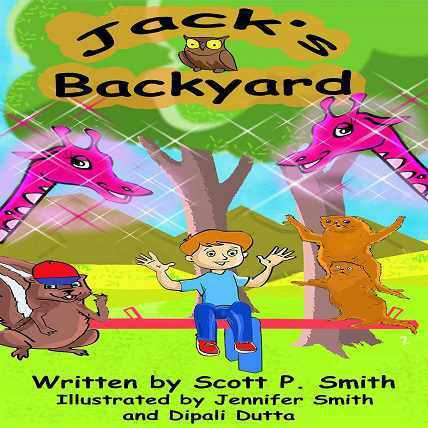 Jack’s Backyard is a bright and brilliantly colored rhyming reader picture book that will delight and educate children and adults alike. Jack Twiggle has a dilemma. He needs a fantastical tale to impress his friends and teacher. But how do you come up with something exciting when you’re just staring at your plain old backyard? Join Jack and discover that things aren’t always what they seem when you add a little imagination, and knowledge of some incredible groups of animals! Jack’s Backyard is a bright and brilliantly colored rhyming reader picture book that will delight and educate children and adults alike. Based on one of the most powerful mnemonic memory techniques, rhyming, even the earliest readers will be able to “read along” quickly. It’s ease of reading, amazingly colorful illustrations, and expertly crafted details of this book will have your little reader coming back to it again, and again!